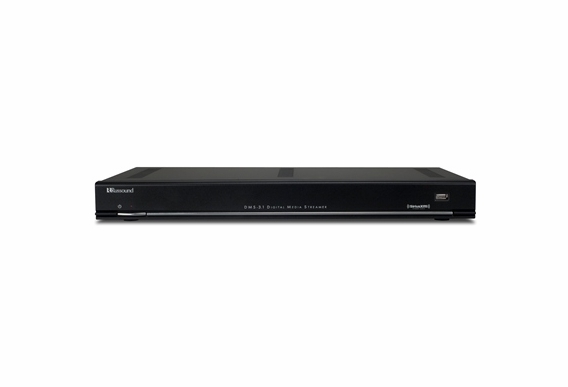 Russound's DMS-3.1 digital media streamer provides network-based digital music to your multiroom system. Catch the weather on your local AM/FM radio station, listen to a live talk show on internet radio, play music stored on your network drive, stream an online music service provider or tap into a portable USB drive. Separate source connections mean three streams are always available to listeners in a multiroom audio setting. The DMS-3.1 has an Ethernet connection for network access and playback of digital audio files on LAN-connected DLNA devices. When connected to the internet through the home's network, the DMS-3.1 can stream content from online radio stations and music service providers. A built-in AM/FM tuner with RDS feedback adds local radio as a listening choice, and multiple USB ports accept connections for playing content from USB storage devices. The DMS-3.1 is designed to work seamlessly with the C-Series controllers, using its preconfigured source names and settings. It supports intelligent user interfaces with media menus and metadata displayed on system keypads and touchscreens. Power Requirement(s): 100-240VAC 50/60Hz 11W (Autoswitching Power Supply). IEC 320 type connector/3 terminal. Detachable power cord.